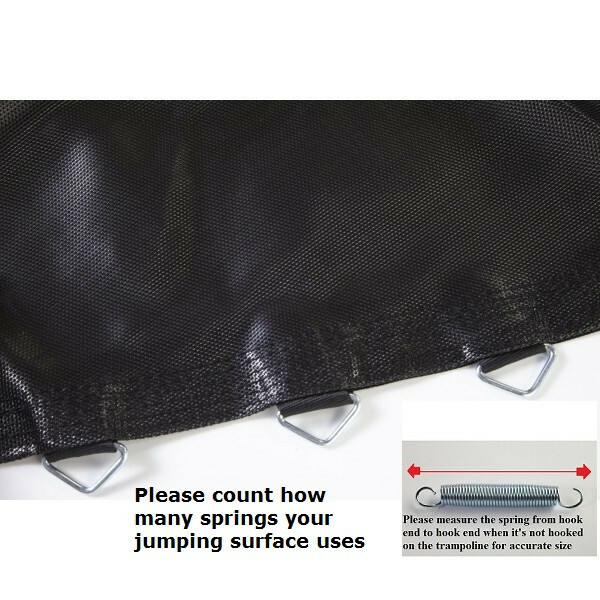 This trampoline Bed (Jumping Surface) is for use on a 12ft Trampoline with 80 Springs that are 8.5 inch in size. SPRINGS ARE NOT INCLUDED IN WITH PURCHASE OF THIS ITEM. Please visit our SPRING SECTION to purchase springs to accompany your trampoline bed. Please see the graphics and instructions below to help in determining the correct size of your trampoline. This will help to ensure correct product choices from our website. Determine the size of your trampoline by measuring the diameter of the trampoline frame. Take the measurement from the outside edge of one toprail to the outside edge of the exact opposite toprail. Be sure to take two measurements in different locations to confirm your size. Determine the number of springs of your trampoline by counting the number of toprails in your trampoline and mulitpling that number by the number of spring holes in each toprail. Please remember when measuring your springs to measure an unstretched or undamaged spring. Measure the complete spring from hook end to hook end.